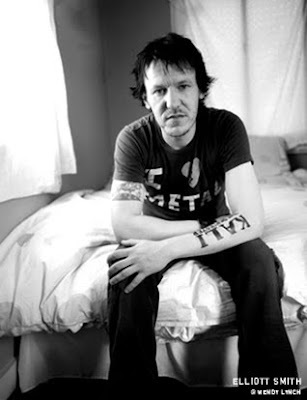 Elliot Smith first garnered national attention in 1998 when his song Miss Misery was featured in the Oscar winning film Good Will Hunting. Despite his success, he never found happiness in his life and six years ago today he was found by girlfriend with a knife in his chest. He died with what the police believe were self inflicted stab wounds (although their official initial incident report does shed some doubt on this theory). In the eyes of many of his fans, as well as his family, Smith's death (at age 34) remains a cold case. In light of his extremely violent death his music lends authority to the view that his death was a suicide. He was a man so deeply tortured by demons, that its clearly plausible that he couldn't bear to live anymore and did himself in. Smith's lyrical content is consistently dark; sometimes sad, sometimes angry and even mocking; but even his happiest lyrics are never brighter then bittersweet. His life story is visible through the barely veiled lines and can make on squirm a little to hear. His parents divorce, his distrust of women and lack of self esteem are all on display throughout his discography. His words can be uncomfortable to read (thus no quotes) yet he wrote harmonies which were so incredibly melodic, that even his darkest thoughts are beautified and palatable on the ears of a listener willing to delve into ugliness. He washed down some of his most brutal lines with Beatles quality musicianship that one rarely sees within singer-songwriters. His music speaks for itself, however what is of interests on this anniversary of his death, is the controversy behind it. Although the cause of his death makes suicide seem unlikely (very few people commit suicide by stabbing themselves); there has been documentation that Elliot had tried suicide by other creative and painful means in the past. In 1998 while drunk and drugged up he ran off of a cliff in North Carolina, but his fall was broken by a tree, and he survived. He threatened record execs at Dreamworks to release him from his contract or he would kill himself; and many friends of his claim that he had also made suicidal threats to them. He had also become a heroin junkie and crack addict for a few years and was rumored to have smoked almost $1500 of drugs a day at the height of his addiction. In short, these facts paint a picture of a person deeply unhappy with themselves despite their success. So why is there still a controversy over his death? This appears to be a cut and dried case of suicide, another tortured artist who took his life like Kurt Cobain only a few years before him. However, if one looks at a time line of his despondent behavior and his substance abuse; it seems as if the worse was behind him at the time of his death. Also the circumstances of the murder paint a plausible case for murder. Details of his death are scant and only one witness was there, his girlfriend of a year Jennifer Chiba. Jennifer was in a punk band called The Happy Endings, and at the time Elliot was producing their first single, but apparently he was difficult to work with, and the two of them had become infamous for fighting. Yet they were living together at the time of his death. He had been sober for six months, and toxicology reports found only "prescription level" amounts of anti-depressants and ADD medications in his body. According to Chiba, they'd just had a fight that morning, and she went in to take a shower when she heard a scream. She came out to find Elliot in the kitchen with a knife sticking out of his chest. She pulled out the knife and attempted to perform CPR while on the phone with 911, however she was not able to revive him. He died in surgery at a nearby hospital at the age of 34, he died at 1:34pm. Apparently a suicide note was found written on a post-it on the kitchen counter which read " I'm so sorry—love, Elliott. God forgive me"
Despite Elliot's previous attempts at suicide, doubt has been cast on his death being a suicide. For one, Chiba's claims of what happened, place her prints on the knife and thus absolve her from guilt, and the suicide on the post-it that was found by detectives was vague. 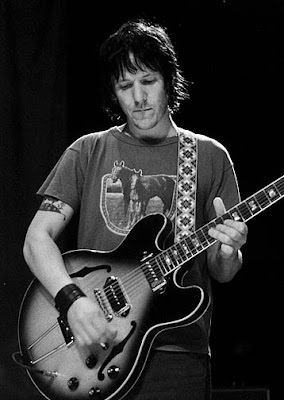 The Los Angeles coroner's office, has yet to officially confirm that the fatal knife wound which killed Elliot Smith was self-inflicted. The Los Angeles Police Department has listed his death as a suicide. 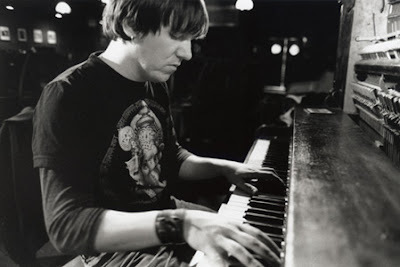 The only one who can truly say what happened to Elliot Smith is Jennifer Chiba. Whether it was an argument that resurrected his suicidal tendancies, or an argument that ended in domestic violence; is not mine to determine. 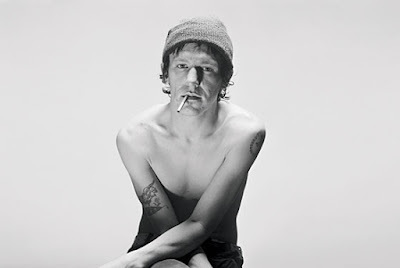 All that is known is that the music world lost one of its most deeply introspective voices today, six years ago. What may make one think twice is that a bootleg exist of the last song Elliot recorded before his death, which has not made either of his posthumus releases. Whether this gives closure to his death is up to you.